Waterparks have announced that their second album titled Entertainment will be released later next year. It’s set to arrive on January 26 via Equal Vision Records and is the follow-up to 2016’s Double Dare. 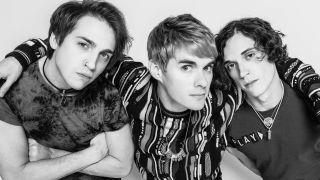 To mark the announcement, vocalist and guitarist Awsten Knight, guitarist Geoff Wigington and drummer Otto Wood have released the new track Blonde. Listen to it below. Waterparks will embark on a North American tour with As It Is, Chapel and Sleep On It throughout November and December, and will hit the road with The Maine early next year across Australia. Find a full list of live dates below. Further Entertainment details will be revealed in due course.